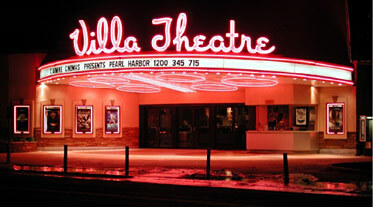 SALT LAKE CITY, UT — According to a report from deseretnews.com, the Villa Theatre was bought by local businessman Hamid Adib. Adib plans to preserve and hopefully restore the theater, and will use the theater as a showcase for his rug business while creating a “museum” of sorts of the Villa. That’s great news, Grant! It’s heartening to learn the Villa’s new owner appreciates the theater’s beauty and is taking steps to preserve it. May you have success in all your endeavors, Grant. My husband and I purchased a building (see the Port Theatre in Port St. Joe, FL) that was in terrible condition when we purchased it. It had been vacant for almost 30 years at that point, and had lost most of its roof ten years prior to our purchase. We gained alot of public support and affection over reversing the condition of the building. It’s still got a long way to go, but meanwhile, it has been a really good home for our business. Sometimes I get a little sad about its restoration taking so long, but I know that in good time, someone else will come along who can take it further than we could (financially). Perhaps one of the reasons developers want theatre properties so much is their typically prime locations. Again, good luck and hope all goes well for you. Grant, thanks for keeping us up to date on the fate of the Villa. I enjoy visiting your website and reading up on the Villa’s history. Whenever I look at the photos, I just want to jump into the picture and experience what it must have been like to visit the Villa in it’s heyday. You have an amazing website, and I hope you will continue to host it for a long time to come.